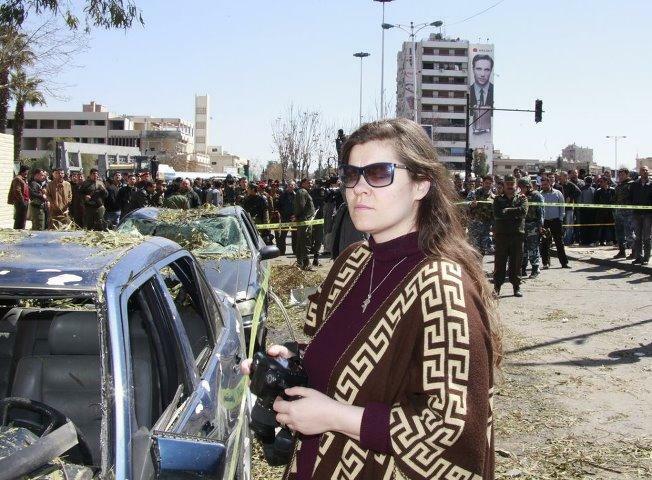 Independent journalist Anhar Kochneva has been living and working in Syria for more than ten years. She says that the situation in Syria is not at all similar to how it has been presented in the mass media. She is Russian, speaks fluent Arabic and her friends and neighbors are ordinary Syrians. She walks along the same streets of Damascus and goes shopping in the same stores as any other resident of the Syrian capital. We recently spoke with her to ask about some of the causes for the long-term disorder in Syria? Were there any prerequisites for the Syrian crisis? First of all, there were no signs of any crisis a year ago. Nothing extraordinary happened in March 2011. The whole thing started out as a case of criminal activity. I always got furious when journalists wrote that ‘mass riots and demonstrations had been taking place in Syria during recent months’. I’ve been living permanently in Syria for the last seven months, and I saw only three ‘so-called demonstrations’. So-called, because there were very few people and they were clearly staged as a performance for journalists. “Protests” were shot on video for five or ten minutes before people quickly dispersed. In some cities, where bandits took control temporarily, they forced people to go to demonstrations. I came to Syria in the late-90s. To tell the truth, I didn’t like the country. Now I’ve been living in this country for quite a while, the country has changed. Life has changed; people have changed. People have started their own businesses; they have their own property. Therefore, people would maybe have supported a protest movement 10 years ago, but now they wouldn’t. Now people want stability. There is unnecessary chaos, some disorders. They used to live in a peaceful country. Syria was one of the safest countries in the region. Here you could leave a bag with money in the street, return two days later and find it in the same place. Now, unfortunately, it’s not like that anymore. People are afraid. Something they were proud of was stolen from them. Who is planning the explosions, shooting at people and destroying buildings? Some weeks ago I was in Homs. I was in the sadly known Baba Amr district of Homs. Most of the residents have left their homes. My friends live 800 meters from Baba Amr. They told me that bandits fired at their houses. Not the Army. The Syrian army does not kill people. They only answer when the situation is extreme. Most of the last months’ casualties were soldiers of the Syrian Army. The so-called rebels fight in the streets, shoot videos and burn tires. If you see black smoke on a video “made by mobile phone”, it’s not the result of artillery fire by the army, it is smoke from burning tires. A month ago I was in Zabadani in southwest Syria. The bandits kept the whole city in fear. We often hear and read in media about the humanitarian catastrophe in Syria. A humanitarian catastrophe begins when a city is in the hands of bandits. In Zabadani, my colleagues and I were captured by bandits. They showed us a rusty tank and said the tank fired at the town. But the two ruined houses were in the middle of the district. I do not think that the tank could shoot from the air or from behind the corner. They gathered a dozen people and organized a demonstration especially for us. At this moment I looked at the people’s faces. I saw only fear and hatred on the faces. They were afraid of the bandits and hated them. You always use word ‘bandits’: aren’t they rebels or the opposition? Syria’s own criminals are also in armed gangs. These are real criminals who should be in prison. Such people can be found in any country. It is very typical that when they take control of a city they immediately burn criminal archives. There are these types of people in any society… the people who like to enjoy the power, who do not want to work but want to have money. We have more and more cases of robbery. Their number is not great. On the other hand, one does not need a large number of people to terrorize the city. Two armed snipers can paralyze life on the streets. The parliamentary elections took place on May 7, 2012. Did the opposition participate in the elections? Yes, the campaign was very active. All the walls of the main streets of Damascus were covered with candidates’ posters. They said 7,200 candidates were competing for 250 seats. Why are you sure that the vote was not democratic? Who says so? The leaders of the Syrian opposition? They have been living abroad, in Europe, for decades. What do they know about the real Syria? What do they know about our needs? Let Syrian people decide their future. The major opposition parties acting in Syria participated in the parliamentary elections. By the way, one more detail to the situation. Three days ago the son of the head of the Syrian National Party was killed. The party got threats that they should not go to the elections, but the party refused and then the guy was just killed. Who is responsible for this? The government or the ones who do not want any positive changes in Syria? The bandits do not need any reform; they only need destabilization and chaos in the country. Who is the conflict in Syria between? Tragically, Syria is an obstacle for the US to change the political balance in the Middle East. Read the book Where to Invade Next, edited by Stephen Elliott, and you will understand a lot about the Arab Spring. Thanks to the global media, we all live in the alternative media reality. The whole world is watching a movie about something which does not in fact exist; it’s fiction in the guise of real events. This is a manipulation of public opinion. UN observers, see for yourselves! What is the attitude towards the Annan plan in Syria? One opinion is that this is an attempt to give the bandits the time to regroup. Everybody we have seen here in Homs told us that in a week the Syrian army would have solved the problems with bandits. On the other hand, there is the second version: that the US wants to get out of this situation without losing face. Through the verdict of the UN, they would recognize the fact that the Government of Syria was right and stop to escalate the situation. I prefer the second version. I think it’s true because it is impossible to not see the truth. You can trick once and even twice, but it is very difficult to trick all the time. I am sure that 300 UN observers will see the truth. Force them to lie – it is difficult. In January, a mission of the League of Arab States gave a detailed report on the events in Damascus. They reported that police conduct in Homs was a reaction to the activities of the armed gangs. So far, the commission’s report of LAS has not been published. I hope that the UN personnel are decent people who will objectively reflect the situation. Finally, do you support the Government of Syria? Me? I don’t know anybody from the government. I support the people of Syria. Nobody else. – Independent journalist Anhar Kochneva, has been living and working in Syria for more than ten years. She is interviewed by Natalia Mihailova. “A lie cannot live.” – Martin Luther King, Jr.